Size - I love that this assisted living is smaller. My father was living in a large senior facility and it was hard for him to get to know so many residents and staff. Staff and caregivers at Flower Mound AL from the moment we walked in wanted to know my dad and made both of us feel welcome. Daily activities - beyond meals - afforded him the chance to meet other residents. 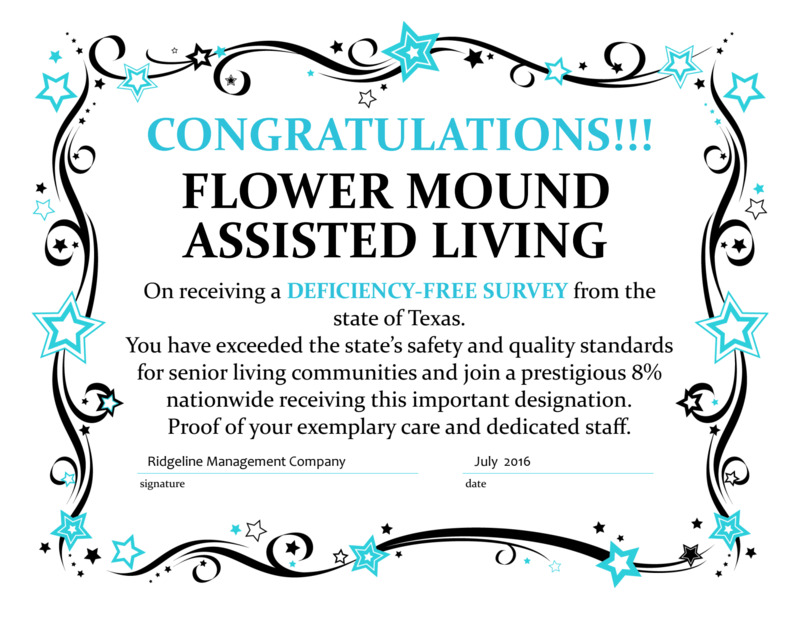 Stability - Flower Mound Assisted Living has been a part of our community for many years. I remember it being built - as my family attended Trietsch Methodist church next door - it was a welcome and needed business in Flower Mound. But the true stability is the staff. Director and staff have been in place for years. I knew all staff and my father saw the same folks daily - this stability meant that the staff knew my father and his unique needs. Compassionate Staff - my father's health deteriorated while living at FMAL, and the nurses and staff worked with me to provide the necessary care dad needed. They were honest about what they could or could not do. They gave me names of resources which I used and were excellent. But more than that - they let me know everything that went on and kept me well-informed, plus showed great compassion for my father. I cannot praise this staff enough for the level of care they provided - it gave me such peace of mind. I mean every word - you guys are wonderful. I know much of the above is because of your leadership and ability to hire the right people. Nita was a wonderful partner and made moving my dad in so much easier. Mary has just the right mix of expertise, clear and straight-forward information and what I call 'rational compassion'. Critical in her role. I wish you and your group only the best and appreciate everything you did for me and my father.